Eugene C. Tarne | February 8, 2018. Soon after then-President Clinton’s National Bioethics Advisory Committee (NBAC) in 1999 issued a report recommending federal funding for human embryonic stem cell research (hESCR) the subject of such funding became one of the nation’s most hotly contested public policy issues. It was the subject of President George W. Bush’s first nationally televised address, and in the ensuing years Congress held a steady stream of hearings on the topic, many of which featured Hollywood celebrities making the case for expansive federal funding of hESCR. Advocates for such expansive funding saw victory when, in March 2009, President Barack Obama lifted all Bush-era restrictions on hESCR. Given that many prominent scientists and researchers had on numerous occasions testified before Congress that hESCR deserved federal funding to the largest extent possible because such research showed the most promise to cure many diseases and conditions, it would not have been unreasonable to assume that, with restrictions lifted, funding for hESCR would soon outstrip funding of non-embryonic stem cell research, such as adult stem cell research. Today, federal funding of human non-embryonic stem cell research outweighs funding for human embryonic stem cell research. Of that total, $213 million was allocated to human embryonic stem cell research. Non-embryonic human stem cell research, however, received $480 million – more than twice as much. If the spending for human induced pluripotent stem cells — $347 million – and umbilical cord blood/placenta stem cells — $34 million – is added to this, then total federal funding for all categories of human non-embryonic stem cell research amounts to $861 million. In 2017, the government is spending four times the amount for funding of all categories of human non-embryonic stem cell research than funding for human embryonic stem cell research. And this general pattern has remained steady over the years. 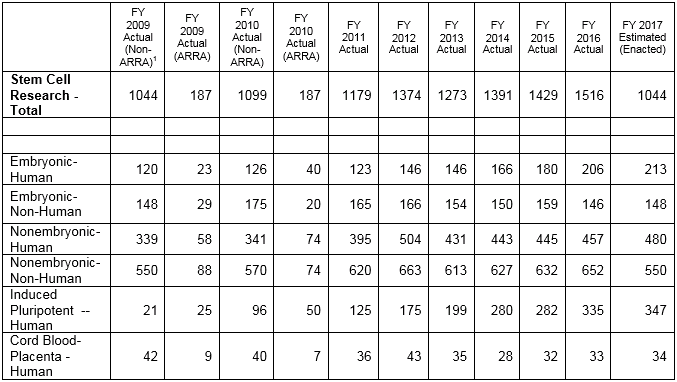 The table below shows funding for human embryonic and human non-embryonic stem cell research from 2009 – the year the Bush-era restrictions on hESCR were lifted by the Obama administration – to the present. For 2009, the total amount of grants for both categories of human stem cell research — embryonic and non-embryonic — amounted to $459 million. Of that, hESCR was $120 million, or 26% of the total. [ii] And that has followed the same trend, with funding for hESCR consistently trailing funding for human non-embryonic stem cell research from 2009 through 2017. When funding for the other categories of human non-embryonic stem cell research – i.e., human iPSCs and human cord blood and placenta stem cell research – are factored in, the proportion of funds going to hESCR shrinks even more. For example, in 2016, the share of funding for hESCR reached a high of 45% of the total of the two categories. However, if the totals from that year for human iPSC and cord blood/placenta stem cell research — $368 million and $33 million, respectively — are added to the $457 million in funding for human non-embryonic stem cell research, then the share of funding for hESCR shrinks to just under 25% for all categories of human stem cell research. According to the NIH’s Estimate of Funding for Various Research, Condition and Disease Categories (RCDC), human embryonic stem cell research has received $1.48 billion in funding since 2009. Funding for human non-embryonic stem cell research for the same period was higher — $3.96 billion. Again, adding in the funding totals for human induced pluripotent stem cells ($1.935 billion) and human cord blood/placenta ($339 million) since 2009, NIH has provided $5.9 billion for all categories of human non-embryonic stem cell research. This website has on several occasions examined state funding for stem cell research in those states that provide such funding. The studies show those states either moving away from a preference for funding hESCR to a preference for funding non-embryonic stem cell research (e.g., California and Maryland), or consistently favoring non-embryonic stem cell research (e.g., Minnesota). Federal funding of human stem cell research appears to follow the latter pattern. Restrictions on funding hESCR were lifted in 2009, giving the federal government the opportunity to dramatically shift resources and give hESCR a proportionately larger share of funding than human non-embryonic stem cell research. Fortunately, it did not. Funding for hESCR research – even with restrictions lifted – has consistently and considerably trailed funding for human non-embryonic stem cell research. There are probably several reasons for this. But almost certainly among them is the fact that human non-embryonic stem cell research has made significantly more progress, and shown far more real promise, in treating diseases and conditions than hECSR, making funding for ethical, non-embryonic stem cell research a far better investment of taxpayer money and far better news for a wide variety of patients. American Recovery and Reinvestment Act, passed by Congress and signed into law by President Barack Obama, February 17, 2009, P.L. 111-5. Embryonic-human; Embryonic-non-human; non-embryonic-human; non-embryonic-non-human; induced pluripotent-human; induced pluripotent-non-human; umbilical cord blood/placenta-human, and umbilical cord blood/placenta-non-human. [ii] In 2009, both categories of stem cell research also received a total of $81 million in ARRA funding; hESCR received $23 million, while human non-embryonic stem cell research received more than twice that, $58 million. For 2010, the last year of ARRA funding, hESCR received $40 million while human non-embryonic stem cell research again received a considerably larger share of $74 million.